Adult Diagnosis: Patterns can be quite variable due to hybridization. 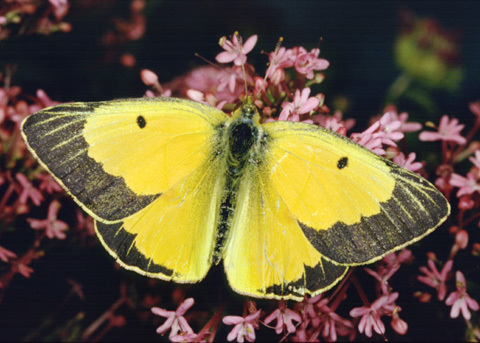 Forewing of males are yellow with orange overlay, have yellow veins, solid black borders, and a black spot. 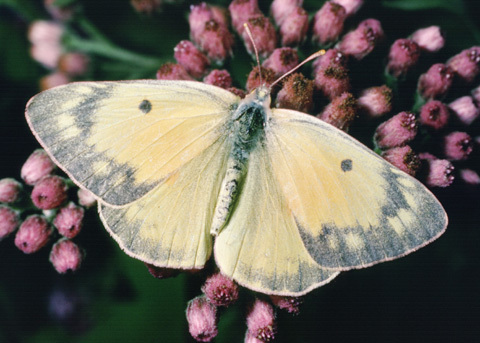 Females can be yellow or white, and the borders are irregular and incomplete. The underside of the hindwings have a silver spot with dark rings around it. Adult/Larval Natural History: Males search for receptive females, who then lay eggs on top of host plant leaves. Larvae emerge and chew holes on top of leaves, eating the tip later. They are only seen feeding at night. Adults are relatively rapid flyers, and have two to three flights in the north from June to October and four to five flights in the south from March to November. Distribution: The species is widely distributed in Kansas. It is widely distributed in North America. Habitat: Larvae and Adults can be found at a variety of open areas, especially alfalfa fields, vacant lots, and meadows. Diet: Larvae feed on legumes and peas, primarily Alfalfa and clovers. Adult feed on nectar from many differend flowers, including dandelion, goldenrods, and asters. Hallwachs, W. D.H. Janzen, J.C. Miller. 2010. 100 Butterflies and Moths: Portraits from the Tropical Forests of Costa Rica. Harvard University Press, Cambridge, Ma. Rainbolt, J.D., B.E. Tabashnik, W.B. Watt, and H. Wheelock. 1981. 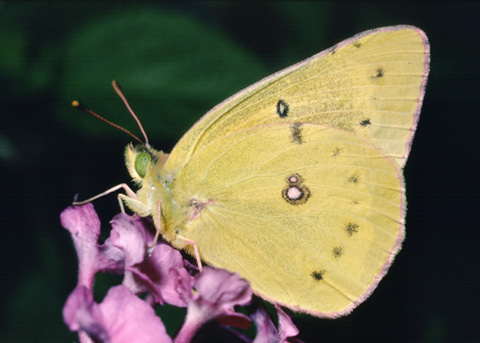 Individual Variation in Oviposition Preference in the Butterfly, Colias eurytheme. Oecologia 50: 225-230. Shalaway S. 2004. Butterflies in the Backyard. Stackpole Books, Mechanicsburg, Pa.
Silberglied, R.E., O.R. Taylor. 1978. 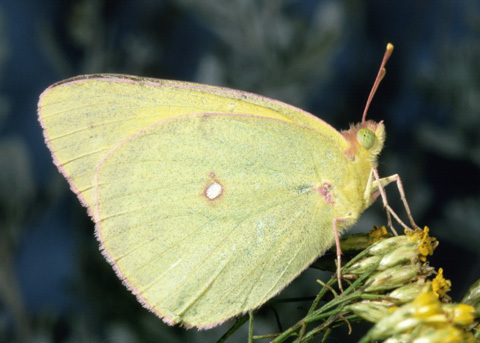 Ultraviolet Reflection and Its Behavioral Role in the Courtship of the Sulfur Butterflies Colias eurytheme and C. philodice (Lepidoptera, Pieridae). Behavioral Ecology and Sociobiology 3: 203-243.